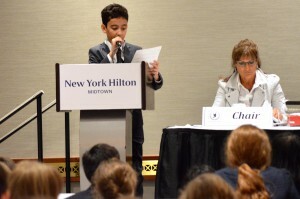 The next two days were completely dedicated to the MMUN Committee Sessions. 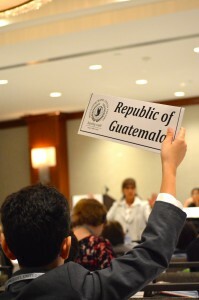 The North Star students, delegates of Guatemala, were involved in two different committees; Economic and Social (ECOSOC) and World Health Organization (WHO). 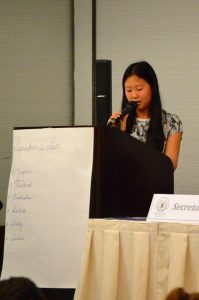 Topics for ECOSOC were Reducing Water Pollution and Increasing Access to Information Technology. Topics for WHO Access to Medicine and Ending Epidemics of AIDS, Malaria and other diseases. 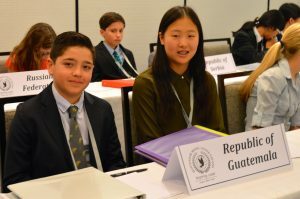 The students had researched the topics, Guatemala’s current circumstances in relation to those topics, and prepared position papers as well as a speech to present while in the committee sessions. Delegates motion and vote on the duration of the speeches and raise their placards to be added to the speakers list. Delegates listen carefully to the speeches, taking notes and tracking which countries are closely aligned with their own goals and strategies. 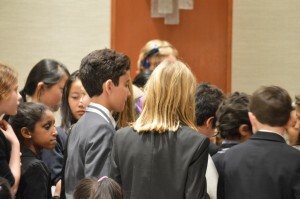 Moderated and regular caucus sessions allow the students to connect with those countries with similar thoughts and begin to work through the details collaborating, compromising and diplomatically expressing their views to come to consensus on a resolution to the topic for voting on at the United Nations in the General Assembly on the final day of the program. In these two days our delegates all successfully presented their speeches and participated in shaping their committee resolutions to varying degrees. We were very proud to witness the success and personal growth their efforts enabled. 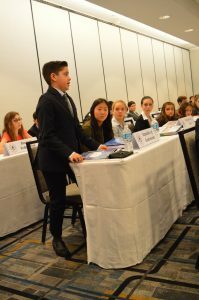 Both UN Committees were commended on their collaboration and had solid, workable resolutions to present for voting on the final day.